When I was eight I kicked a clown in the shin as hard as I could. I don’t like clowns. I think they’re creepy and I make it a policy to never turn my back on one. I wouldn’t go so far as to say I’m scared of clowns, but many people are. Coulrophobia is often cited as the third most common phobia, only ranked behind needles and spiders. Ronald McDonald… okay, I’ll admit that Ronald probably shouldn’t be lumped in with those other guys but he could have given me a free Happy Meal everyday for a year and it still wouldn’t have repaired my damaged psyche. I think this is a “chicken or the egg” type issue. Are people scared of clowns because of the way they are portrayed in popular culture or does popular culture capitalize on a pre-existing fear? Psychologists believe a childhood fear of clowns has to do with the natural and innate fear of disguised or exaggerated figures. 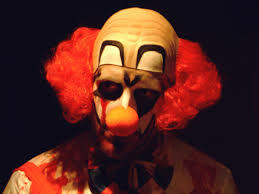 In fact, a 2008 University of Sheffield study stated flat-out that “kids hate clowns.” Over 250 children, aged four to sixteen, were surveyed and clowns were found to be “universally disliked” by all ages. Some found the clown images to be quite frightening and unknowable. The poll was aimed at improving local hospital decor for the children. Needless to say, they didn’t paint any clown murals. This intrinsic fear of the unnatural makes sense to me. My kids were scared of anyone in a costume until they were five. They screamed and cried at parades when the RCMP bear walked by, or at the water park when Salty the Turtle waved at them from a distance. C’mon, these kids were scared of Santa at the mall. A few decades ago, an adult fear of clowns was almost unheard of. In fact, the term coulrophobia didn’t even exist before 1980. Adults had no reason to be scared of clowns when the only ones they had grown up with were in the circus or at a birthday party. I believe, for the majority of cases, a fear of clowns is a childhood distrust of the unknown that has been amplified and warped by modern culture. Imagine if we showed pictures and films of a scary Santa committing violent acts just at the age when children are beginning to accept him as a good guy. I’d bet quite a few of them would grow-up still quaking in their slippers every Christmas eve. I know there are a lot of fantastic clowns out there doing good work and spreading joy. Like my pal Buddington at our local children’s hospital. The difference is, except for being really goofy and having a painted red nose, he’s pretty normal looking and very non-threatening. I clearly remember why I kicked that clown in the shin when I was nine; he was right up in my face and mocking me because I wasn’t laughing. Well, I didn’t feel like laughing… and then neither did Bozo. This entry was posted in General and tagged Clown, Coulrophobia, Jack Nicholson, John Wayne Gacy, Killer Klowns from Outer Space, Phobia, Scary, Simpsons, Stephen King. Bookmark the permalink.